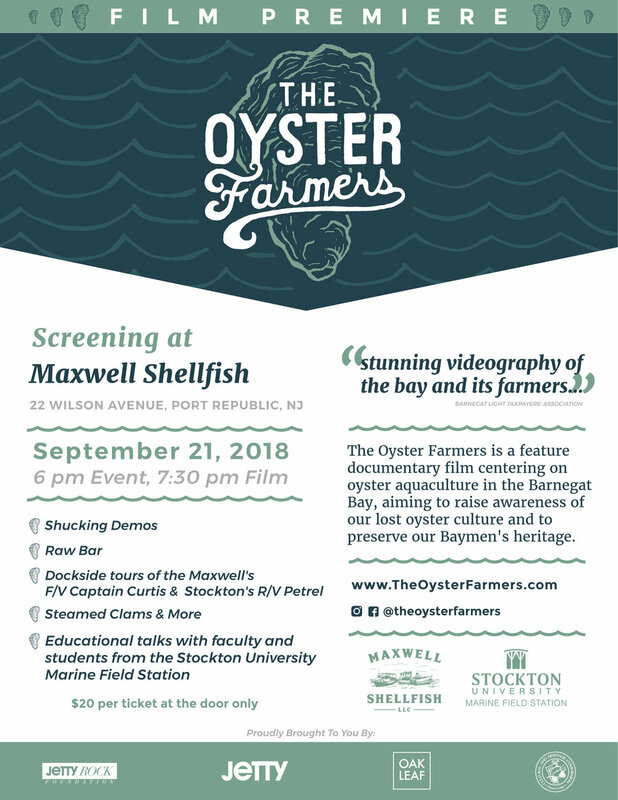 Join us, together with our friends at the Stockton University Marine Field Station, as we present The Oyster Farmers. This documentary film centers on oyster aquaculture in the Barnegat Bay, aiming to raise awareness of our lost oyster culture and to preserve our Baymen's heritage. We kick things off Friday, September 21st at 6:00pm! The film will begin at 7:30pm. In addition to the film, Stockton will be doing boat tours of R/V Petrel along with educational talks. We will be providing a Raw Bar and Steamed Clams. $20 per ticket at the door. Make sure to BYOC (Bring your own chair or blanket!) and BYOB! Email Info@MaxwellShellfish.com with any questions!